Dyslexia is a specific learning disability that has neurological roots. It primarily affects one’s ability to read. People with dyslexia have difficulty with accurate and fluent word recognition. They also tend to have poor spelling and decoding abilities. It is not uncommon for two or more children in a family to have dyslexia. One person might have mild dyslexia while the next person can have a profound case of it. It is estimated that Dyslexia affects 20-30 percent of our population. Even though people with dyslexia have average to above average intelligence, their dyslexia creates problems with reading, speaking, thinking, and listening. This, in turn, can create emotional problems and self-esteem issues throughout their life. Self-esteem can be a contributing factor for low grades and overall under achievement. The main difficulty for dyslexic students is poor phonemic awareness. Phonemic awareness is when the listener is able to hear, identify and manipulate phonemes, the smallest units of sound that can differentiate meaning. Separating the spoken word “bat” into three distinct phonemes, /b/, /a/, and /t/, requires phonemic awareness. A dyslexic student’s brain may only hear one or two of those three sounds. Developing phonemic awareness is the first step in learning to read. The problem in reading doesn’t lie in how the student “sees” the word. For example: A student that sees the word “SAW” doesn’t see it as “WAS”, they have trouble manipulating the word and sounding it out in the correct order. They must look at words in parts, meaning they must break the word into syllables. The student spends so much time decoding that their reading speed tends to be a lot slower than other students in class. An understanding how the brain functions is helpful in understanding the brain of someone with Dyslexia. 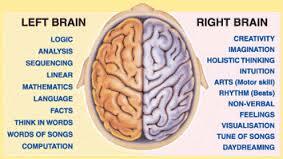 The brain is divided into 2 hemispheres. The left hemisphere is in charge of language and ultimately reading. The right side of the brain generally handles spatial activities. Research has found that those with dyslexia rely more on the right side of the brain and frontal lobe than those without it. When a person with dyslexia reads a word, it takes it a longer time to get to the left side of the brain where it is being processed. It can get delayed in the frontal lobe of the brain. Because of this neurobiological glitch, they read with more difficulty. The good news is those with Dyslexia can physically change the way their brain functions with multi-sensory intervention and cognitive therapy. They can be trained how to effectively use the left side of their brain and thus improve reading. Learning Enhancement Center offers such training. We have a proven 13 year track record in helping children and adults with Dyslexia.